Internal investigations into the conduct of over two dozen House members have been exposed in an extraordinary, Internet-era breach of security involving the secretive process by which Congress polices lawmaker ethics. Producers are reeling because of not just the size of the decline, but the speed. Futures contracts for Class III milk, a measure of wholesale prices, reached a high of $20 per hundred pounds in June on the Chicago Mercantile Exchange. By January, the price was below $10, though it has since ticked up to about $10.50. Increasing numbers of scientists and doctors are issuing harsh criticisms of the Government's plan to vaccinate (forcibly if necessary) virtually the entire U.S. population with what they claim is a poorly tested vaccine that is not only ineffective against swine flu, but could cripple and even kill many more people than it helps. The bill -- a combination of versions passed by three House committees -- includes what is termed a "negotiated rate" public option. It will cost $894 billion over 10 years and extend insurance coverage to 36 million Americans, according to House Speaker Nancy Pelosi's office. With the Great Crisis, these matters take on a new importance. To this day, Chairman Ben Bernanke has refused to disclose to Congress exactly who has received help under the many crisis measures and under what terms. The legal and constitutional situation is clear: Congress has a right to this information. There are no plausible national security concerns. On another six occasions, Paul introduced bills that would have abolished the Fed entirely. Those acts of legislative defiance accomplished nothing much besides giving the congressman a reputation as an eccentric gold obsessive, hectoring an institution that was seen by almost everyone, critics and supporters alike, as foundational to the functioning of the modern world. Roll Call, a newspaper covering Capitol Hill, chided Paul after he won reelection to Congress in 1996 for his "idee fixe" of "a return to the gold standard," which it described as a "rallying cry that hasn't been a real issue since 1971." Will Ron Paul Give it Another Go in 2012? The Texas congressman and hero of limited government advocates will visit the key early primary state of South Carolina on Nov. 9 to deliver a speech "on the future of individual liberty and the importance of the U.S. Constitution" at the University of South Carolina, student groups said Tuesday. The announcement comes a week after Paul scheduled a visit to Iowa on Nov. 13 to speak to students at Iowa State University. Last week a new bill was introduced in the Senate to audit the Federal Reserve. Some backers of my bill HR1207 and the existing Senate companion bill S.604 were a little miffed at this, but depending on how you think about it, this new legislation poses no great threat to our efforts. Seventy-five percent of the American people, over two thirds of the House of Representatives, and over a quarter of the Senate support Ron Paul's Audit the Fed legislation. With those historic levels of support, there is no excuse for settling for anything less than a full Audit the Fed bill. Anything less is merely an attempt to stop our efforts as we get closer to passage of a real bill. Let your senators know you expect them to support the American people's demand for full transparency, not some watered down measure designed to stop a full audit! Foreign Service officer and former Marine captain says he no longer knows why his nation is fighting...last month, in a move that has sent ripples all the way to the White House, Hoh, 36, became the first U.S. official known to resign in protest over the Afghan war, which he had come to believe simply fueled the insurgency. I want to focus on a regular Wall Street Journal columnist who praises the Obama administration's plans to violate property rights in pursuit of socializing medical care. The conventional dichotomy between "liberal" and "conservative" newspapers is spurious: all major news organizations support the welfare-warfare state. A White House effort to undermine conservative critics is generating a backlash on Capitol Hill - and not just from Republicans. The above statements are typical of the lines that have been fed to the people of the world from the controlled media. In fact, the drum beat has been so deafening that you would think that people were dropping like flies. Sure there have been some deaths related to the flu but most have affected individuals with risk factors such as pre-existing lung conditions or people who are immunocompromised. Most healthy individuals that I have personally seen and in general have experienced nothing more than run of the mill flu symptoms. When CNSNews.com asked House Speaker Nancy Pelosi (D-Calif.) on Thursday where the Constitution authorized Congress to order Americans to buy health insurance--a mandate included in both the House and Senate versions of the health care bill--Pelosi dismissed the question by saying: "Are you serious? Are you serious?" The Senate must soon increase the national debt limit to above $13 trillion - and Democrats are looking for political cover. 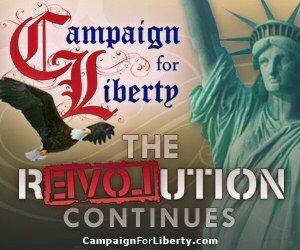 Campaign for Liberty believes it is time to reform the way health care is delivered in America. Years of ruinous government intervention, excessive regulation, and corporatism have damaged the patient-doctor relationship and driven up consumer costs. Audit The Fed- Sign The Petition & Join The Cause! Director Alex Jones warns in his new film 'Fall of the Republic', launching today, that supporters and fellow patriots must stand up for liberty against the enemies of the Republic or forever be enslaved by an elite ruling through tyrannical social control. The banking system today may be in a more precarious position than it was a year ago, the man charged with overseeing a $700 billion bailout program said Wednesday. The number of U.S. workers filing new claims for unemployment benefits rose more than expected last week, data showed on Thursday, indicating the labor market remains fragile despite signs of economic revival. "It's clear where we're headed," says Niall Ferguson, author of The Ascent of Money. "Ten years from now there will be more than one international reserve currency," he tells Tech Ticker. During that long summer between the collapse of Bear Stearns and the collapse of Lehman Brothers, Hank Paulson held a secret meeting with the board of Goldman Sachs in Moscow. Washington D.C. October 20, 2009 -Today, Senators Jeff Merkley (D-OR) and Bob Corker (R-TN) introduced the Federal Reserve Accountability Act, an attempted compromise on the issue of transparency for America's secretive central bank. The bill would permit an audit of the Fed's actions in the Troubled Asset Relief Program (TARP) and similar high profile bailouts, but would not allow Congress to review the Fed's inflation of the money supply or the its agreements with foreign central banks.